I have friends expecting their 1st baby on July 4th, which is also my birthday. That makes this little girl extra special to me. I want to make her a quilt with RW&B but I want to make it kind of feminine. Does anyone have any suggestions? Maybe add eyelet lace somewhere in the quilt. Lace always softens the look. Big rick rack is also a nice addition! I am too blessed to be stressed and too anointed to be disappointed! What about a flower/hexie quilt? Like the one at the below link, only in the right colors. go to of Valor website and look at their 10th anniversary quilt pattern, with 1 -/2 inch sashing its a beautiful quilt. pinwheels are always nice for babies. I like the idea of pinwheels too. You might consider working a floral print in that color way into the quilt. Polka dots are also cute and might be easier to find in red white and blue. I saw a cute simple quilt of just strips of red and blue with smaller white strips in between. You could then applique large white flowers with red or blue centers over the stripes. You could incorporate ric rac as the flower stems and lace around the border if you like. Use some gathered strips, or puffing in between rows. Scallop or ruffle around the edges works too. If you could find some fabric w/ "girl" things in it, such as dolls, little girls, animals, that might be cute in red,white and/or blue for a girl. She may not arrive on July 4th! Unless they are having a C section, of course. If you can use some vintage-looking red with hearts or bows, or white shirting fabric with delicate flowers in red or blue, that would be cute. Here is a quilt top I made earlier this year for some ideas on the fabrics. "He who masters the grey everyday is a hero." Wonderful suggestions here! Like the rick rack, scallops and flower suggestions! My son was also due on July 4th. When he was 2 weeks late, I was induced. 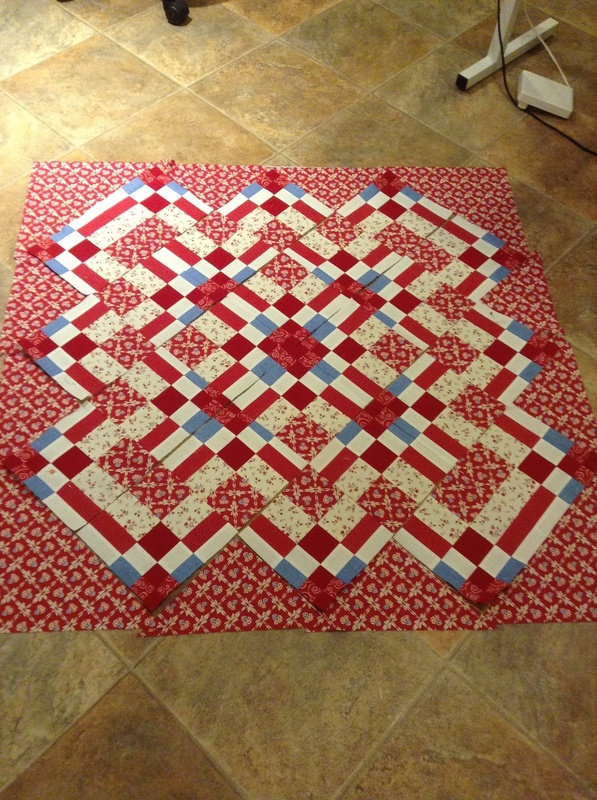 Would you still want to give a red, white and blue quilt if her birthday was July 18th? Jennie Penny's quilt is really nice, feminine. Thanks for all of the suggestions. I might go with light RW &B and make something simple then overlay it with big flowers, ric-rac or something like that. I apologize about replying so late. It took me quite a while to figure out how to find the post I had done!